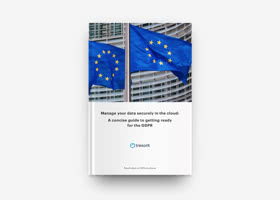 Identifying your data management processes and choosing strong safeguards for your data are critical steps on the roadmap towards GDPR compliance. This webinar is a joint presentation by information security expert John Clelland, Managing Director of Proteus-Cyber, and cryptography engineer Istvan Lam, Co-founder and CEO of Tresorit. Join us as our experts share best practices on reaching GDPR compliance for small and medium sized businesses.